This morning I went to Stanley Hauerwas' first lecture at Azusa Pacific University. 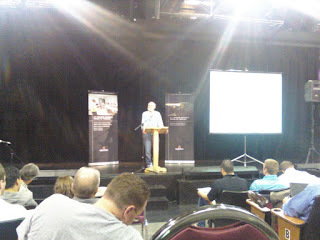 As should be expected, Hauerwas was incredibly insightful and remarkably interesting. His topic was "Pentecost: Learning the Languages of Peace." Notice that it's languages of peace and not language (singular) of peace. Stanley pointed out that it's not helpful to talk as though there is one language through which we can all communicate. Communication is paradoxically the very root of our differences as it is also the culmination of our being human. Communication and a shared language comes from a shared life. Therefore communication is not something we can do outside of bodily experience. Thus we must open ourselves even to the folks to whom nobody really wants to be open. We must patiently tend to those to whom no one tends. That's peace! Though we are all fragmented, fragmented and divided in our communication, we can still begin by speaking the language of peace within our own language and as it was in the Pentecost others may find themselves understanding in their own language (not forcing everyone to speak the same universal language). The Church, as a social ethic, must embody the anticipation of a future in which it may be possible to write a unified world history. At the very least, this means refusing to kill the ones for whom Christ died on the cross--that's everyone! When we speak our language of peace, we will find ourselves at peace but ironically as we work toward this language we must be ready for conflict. We must be ready for conflict because non-violence means exposing an entering into conflicts before they become violent. One thing I really enjoyed from Hauerwas was that for him, non-violence and peace are not tactics through which we reach world peace. We are not non-violent so as as a means to make the world less violent, we are non-violent because in a violent world as followers of Christ we cannot imagine any other way to live, and this may in fact make the world more violent. Nevertheless the church must embody what it experienced in the Pentecost, it must embody the language of peace, it must refuse to kill the ones we're supposed to love--not as a means to an end but as a way of living the life that's truly life. There's probably more to come... Stanley has another lecture tonight.